An individual look for the man you love. Celebrate your special day in sleek contemporary style. This men's 9ct white gold wedding band is 5mm thick, and features a unique contrast of satin and polished finish. 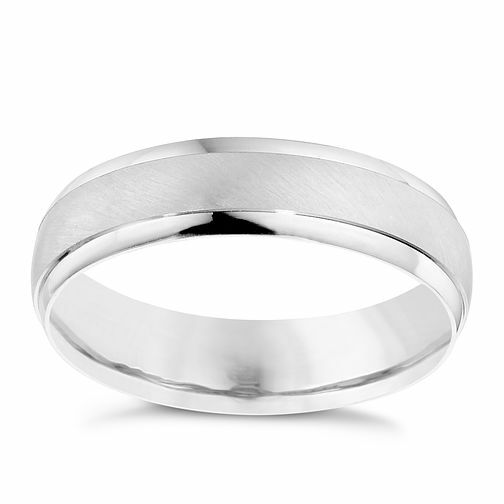 Men's 9ct White Gold Satin Polished 5mm Band is rated 4.0 out of 5 by 5. Rated 4 out of 5 by Anonymous from Great Great ring, looks nice and feels comfortable. Only brought as a replacement as husband lost his original one. Rated 1 out of 5 by Anonymous from The Matt effect in the middle wears off Loved the look of this ring, even read some bad reviews but still picked it. What a mistake. The matt effect in the middle scratches/wears off really quickly leaving you with a dull looking ring that is embarrassing to show anyone. I highly, highly recommend you avoid buying this ring as you will only be disappointed in the future! !